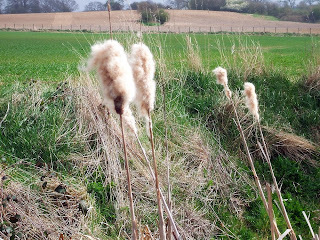 Saw a long row of bulrushes when out walking today, and they reminded me of my favourite "When I was a teacher" story. It was my very first class, 6 year olds. Chris came runnng in clutching a picture he'd drawn me - he said it was "cos of the lesson we did yesterday miss"
I thought hard. I didn't remember any lesson that this picture might relate to, but new teachers are told never to let on you can't recognise the subject of the little artist's work. "Tell me all about it" I asked. "Well," he said, pointing to the two top characters, "there's the bulls"
"And see this bit?" (He pointed to the circle) "That's the basket"
"And in the middle of the basket - that's Moses"
"And see these little lines by the bulls feet, and by Moses? They're what you draw to show that they're rushing..."
This is so lovely! I'm sure everyone has similar stories from when their littluns misunderstood, my daughter once told me her nursery teacher was away on a horse, actually she was on a training course! oh bless! If the course was anything like some of the courses I had to attend, horse-riding would probably have been way preferable! Oh what an adorable story. Thanks for sharing it. I bet you could write a book out of comments like that. I love the way youngsters think, I think they ahve a much better perspective than we do at times.